Untold Casino | Read our Raving Review & Claim your Welcome Bonus! There are many new online casinos out there. However, each of them has something different to offer. This is the philosophy behind the operators of Untold Casino. Viral Interactive limited presents a new platform that promises to offer players an experience that is quite unfamiliar. Starting with the design and layout of the website, Untold Casino sends a clear message on what players can expect. Untold Casino presents a platform that offers an exciting adventurous experience. Each game presents a new challenge; a new adventure and a new experience. As well, there are plenty of games which mean that you can never get used to the fun. The activities of Untold Casino is closely monitored and regulated by the MGA and the government of Curacao. We are not sure whether players from the UK can join in the fun since they do not have a UK license. Untold Casino takes the bull by the horn in the quantity and quality of games in their collection. For players who have been searching for such variety, search no more. With more than 1900 games to play, this is one of the few platforms that offer such numbers. What’s even special is that each game is considered as an adventure. Each game at Untold Casino offers players the chance to take a trip into an “untold” world of mysteries. Untold Casio pulls this off with several partnerships. They integrate games from providers such as Evolution gaming; NetEnt; Betsoft; Ezugi; Pragmatic play; Yggdrasil; Microgaming; Betsoft and many more. Hence, players can enjoy their collection of more than 1800 video slots. Likewise, there are more than 100 games in the live casino section. This is quite huge. Players can enjoy Baccarat; Blackjack and various Roulette games. Find even more in the full listing of casino slots. I love bonuses, we all do! Likewise, every platform offers bonuses to every new player. However, what you get from Untold Casino is quite “untold”. The platform offers a cumulative welcome bonus up to £2331 and 777 extra spins on some selected slot games. This welcome bonus is strictly for everyone over their first three deposits. First deposit: Untold Casino offers every new player a massive opportunity to double their chances of surviving their first adventure. As a wanderer, you need all the help that you can get. Hence, Untold Casio offers as much as £777 plus 150 magic spins. Second deposit: Continue in the trend and Untold Casino will hold their end of the deal. Get another 50% boost up to £777 when you make another deposit. This comes with some cool 200 extra magic spins on your favourite slot games. Third deposit: now that you are getting used to the task ahead, begin the exploration with a final boost. This time, new players will also receive 50% up to £777. This comes with an improved 30 extra spins. In the end, the extra spins sum up to 650. However, to reach the mark of 777, you must ensure that the sum of the three deposits is up to £100. Furthermore, players must wager 40 times before requesting for payout. 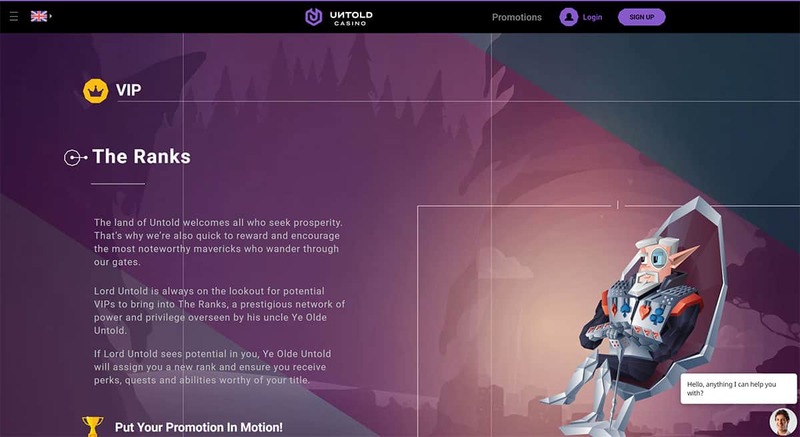 Untold Casino gives a 30 days period for cash bonus. However, extra spins are only valid for 7 days from the day it was received. The quality of the welcome bonus is very attractive. It is one that players would find very difficult to resist. However, Untold Casino does not intend to stop at just getting the attention of new players. They also intend to keep them for as long as they can. Hence, Untold Casino has many active promotions. Magic Mondays: Start your working day on a flyer with the Magic Monday promotion. Every Monday, Untold Casino rewards every player with some extra magic spins. The number of extra spins that you get depends on the number of deposits that you have made the previous week. For example, £20 gets you 7 extra spins; £50 gets you 33 extra spins while deposits above £100 get you 77 extra spins. However, this offer is not available to users with pending withdrawals. The BFF Bonus: Untold CASINO believes in the quality of what they have to offer. Hence, they encourage players to invite their friends to join the adventure. Therefore, Untold Casino has a special referral promotion that rewards players for every new friend that they invite. Hence, when your friends make a minimum deposit of £100, you will receive 20%. However, for deposits less than £100, you will receive a fixed reward of £10. The VIP program: The VIP program at Untold Casino is exceptional. Players get to rise through the ranks based on their performance. Hence, you can start as a wanderer, explore the different adventures, equip yourself to become a knight; fight your way through the challenges and become a champion; keep winning until you become a legend. The rewards are clearly spelled out and you bet that it is quite massive. There are lots of unfamiliar names on that list. This is to take care of players from specific regions. The information on the maximum and minimum withdrawal for each payment method is also stated on the website. Untold Casino operates a fast payment system. Payments are released between 1-4 business days especially for ewallet options. As usual, card options require more time. Hello, anything I can help you with? This usually appears as a pop-up from the Untold Casino live support crew. Hence, this sends a message that they are ready to provide you with any assistance that you need. In addition to the live support, there is an FAQ section, a dedicated telephone line as well as an email address. The web design is beautiful and simple. There are plenty of games. Likewise, the promotions are out of this world. Untold Casino makes a brand new entry into the world of online gambling. They present you with a lot of options than your regular casino. Still looking for more? Find a complete listing of new UK casino sites here.